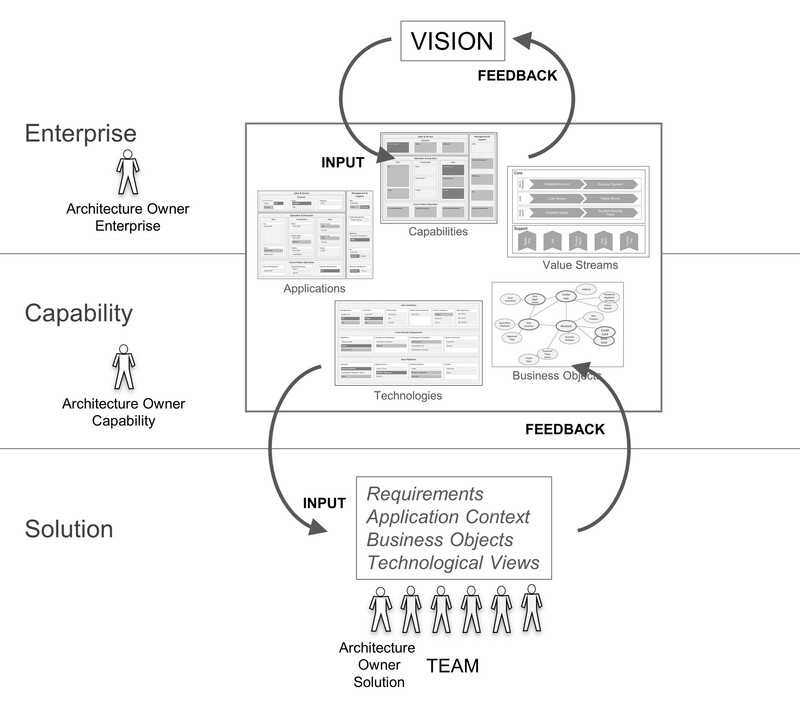 Architectural Thinking defines three scopes of architecture: (i) enterprise, (ii) top-level capability and (iii) solution. Approximately 80% of architectural work is carried out during implementation at the solution level. A team creates architectural maps that are specific for the solution collaboratively, but connected well with the maps on the higher (capability/enterprise) levels. An ‘Architecture Owner – Solution Level’ is responsible for the conceptual integrity of the solution, which means that the micro-architectures of each team member fit together. In order to ensure that solutions that support the same top-level business capability fit together, single minded architectural work at capability level is required. An ‘Architectural Owner/Capability Level’ creates the capability-wide architectural maps by aggregating and consolidating the work carried out at team level. The remaining maybe 1% of architectural work is carried out at enterprise level. An ‘Architectural Owner/Enterprise Level’ creates the enterprise-wide architectural maps by aggregating and consolidating the work carried out at the lower levels. The architectural maps at solution level are connected to the enterprise-wide maps via unique references (e.g. solution requirements must refer to exactly one business capability). This allows permanent feedback cycles between solution architecture and capability/enterprise architecture. The business vision is an important input for the design of the enterprise-wide architectural maps. On the other hand, architectural work at enterprise-level typically leads to questions that must be addressed in the vision statement and is the perfect feedback mechanism to challenge the vision. The enterprise-wide architectural maps are an important input for the scoping of solutions. These permanent feedback-cycles ensure that findings at solution levels that are relevant at enterprise-level are taken to the next level. Thus, the architecture owner at capability level uses the findings of the solution level as an input for the target architecture of his/her capability.